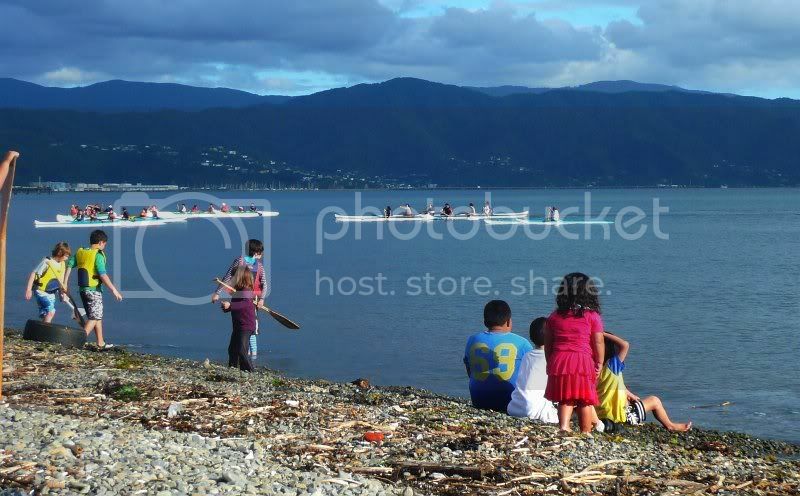 Waka ama (outrigger canoe) racing down on the Petone foreshore. As a fundraiser the local club hosts a splash-and-dash series of sprints for any group that wants to give it a go. So Joern from work rounded up three teams and away we went. Petone is a bit run down and industrial, and there are more scraps of plastic on the beach than shells, but the harbour was flat and surprisingly pretty in the early evening light. I think I'll have to head down there with my camera again at that time of day. Jas was there, documenting our efforts, and I took the opportunity to play with the Ministry's Nikon D60, to which she'd attached an enormous (80-200 mm I think) zoom lens. The lens made getting a group shot somewhat comical, as she had to stand on the other side of the carpark to fit us all in. This shot is from my little P&S, but I hope to retrieve some of my pics taken with the Nikon from Jas tomorrow. I must remember to take a memory stick. My team was late off the mark in the first race, third of four in the second and pulled off a blinder and won the third by about half a boatlength. My arms are feeling a bit limp now, and I'm sure they'll be sore in the morning. It's a good feeling.